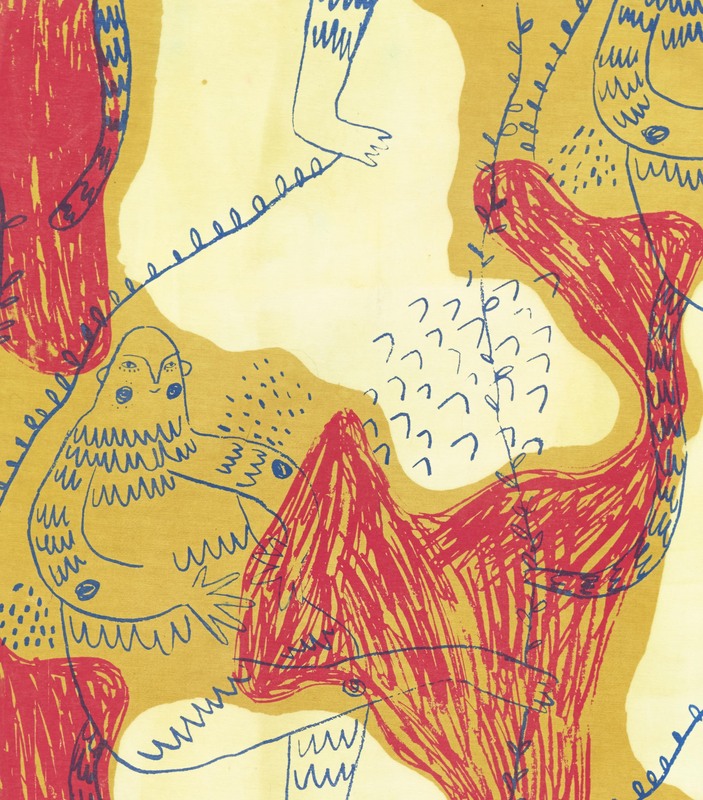 ‘We See Creature Folk’ is a body of work which explores and illustrates several narratives through print and pattern. These stories portray social justice messages and are told through the creation of creatures and locations. Inspired heavily by both primitive and folk art; the collection supports the idea of something being created with a purpose but also being appreciated as art itself as well as having a very handcrafted feel. 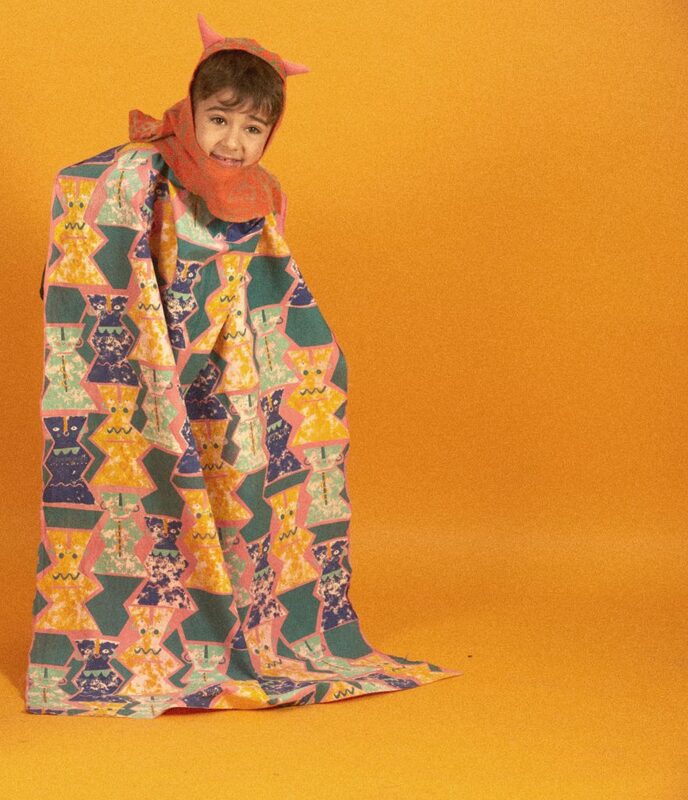 ‘We See Creature Folk’ is primarily aimed at children, however, each design’s purpose is multi-functioning through all ages, genders, and final functions and purpose. 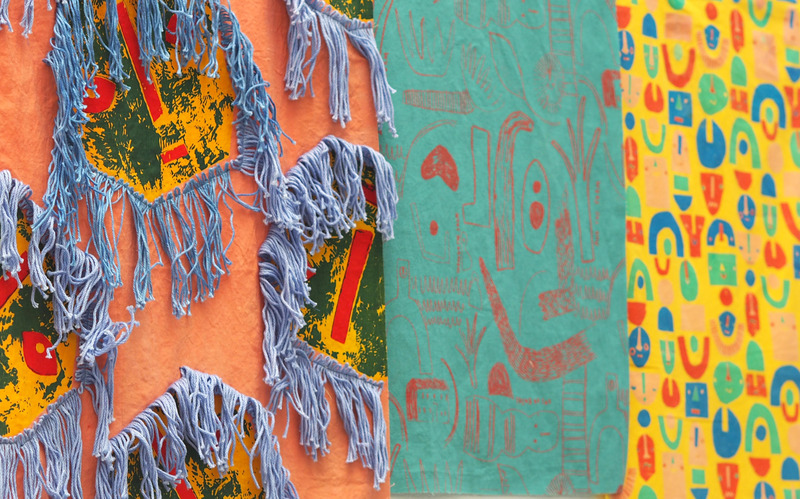 The printed textile collection spans further than just a fashion range aiming to work as a lifestyle range with endless possibilities for its reproduction in various products such as: ceramics, storybooks, badges, masks, costumes, mobiles and wall hangings. 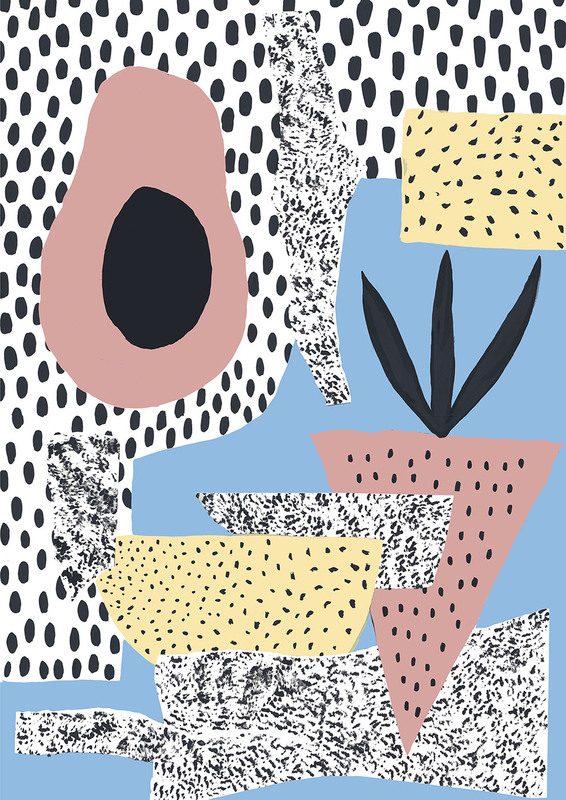 The relationship between shape, form, colour and figurative illustrations moulded this collection, working as an exploration of how illustration and pattern intertwine. A really exciting moment during the creation of this collection was the inception of my concept – it was an idea that really meant something to me and something I was passionate about. That extra bit of researching meant I had an idea that I could really go for it with and I didn’t need to worry about tiring of my idea. Something that was difficult throughout FMP was keeping going and not running out of puff, especially when it feels like you’re running out of time with so much to do. However, even though it’s a cliché, it all does come together in the end! Another high from my project was shooting all of my fabrics for my Look book, it was so nice after all those months of working on the designs to see everything coming to life. It was also really fun to get creative with shoot ideas. Any advice for students following in your footsteps? Try to get at least one internship whilst at university! It does wonders for your confidence and the more you have when you leave the easier it will be to find a job as you’ll have invaluable experience! Also, just continue working through – even though you may want to slow down or give up in a project. You only get to do it once so you may as well make the most of being at uni’ and having all the feedback – that is probably the thing I’m going to miss the most! With that in mind take as much work to your tutors as you can during tutorials. The more you have the more they can help you! 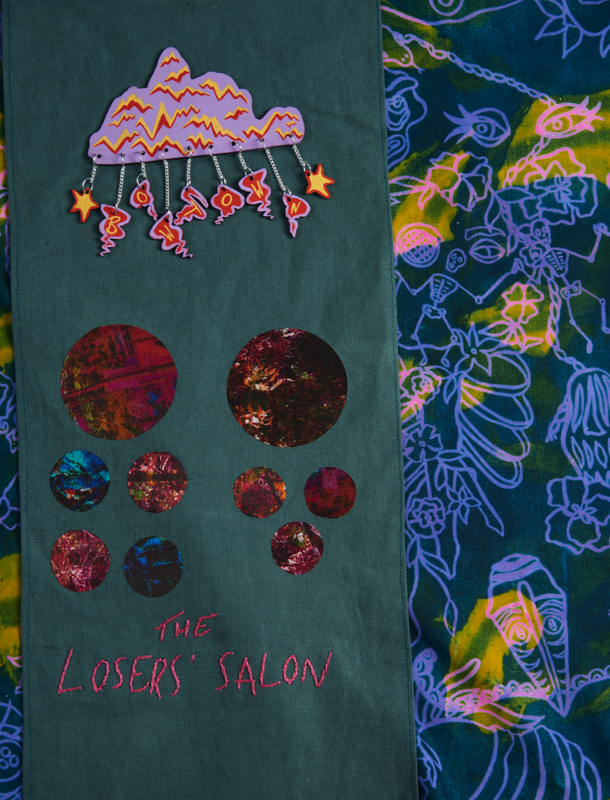 When talking to final year BA Printed Textiles student Rosie Franklin, it is really insightful to get to know her as a designer and to learn the story and background behind her final collection titled ‘The Loser’s Salon’. Taking inspiration from creators like Patty Smith and a trip to the picturesque scenery of New Zealand Rosie invented her own magical town based on the story of her childhood, of a time when her Gran would joke about being a witch and the superstitious events that would happen on a daily basis on her suburban farm. Rosie has been able to pull in all her favourite hobbies and inspirations in order to create a collection that is true to showing who she is as a designer, and, she has had fun doing it. 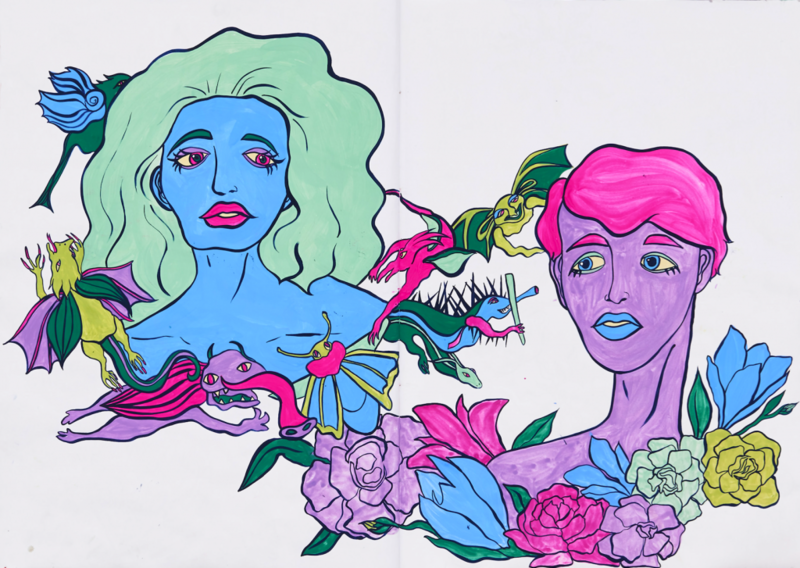 Her wacky and extravagant illustrations make this collection stand out and her colour scheme is something to die for. In order to make things even more fun, Rosie organised and ran life drawing events, which, in turn, helped keep the inspiration flowing and gave others a taste of her eccentric mind and design process. What I personally love most about talking to Rosie is her enthusiasm and excitement towards her work, there is just so much emotion and personal attachment to her work that she radiates passion and happiness. She was able to use traditional screen printing skills in order to create an illustrated aesthetic and said that she is so happy that Winchester School of Art has the resources to carry out what she loves and that it will be something that she misses when she goes into the wider world. I am super excited to see Rosie’s Final collection and even more excited to see what she achieves in the future. 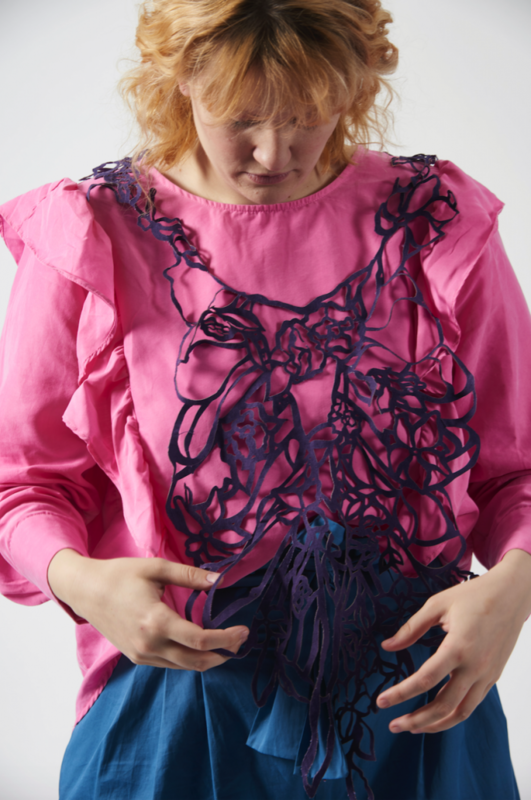 For the second year running Fashion and Textile Design students from both second and third year had their design work exhibited at PV Designs, part of Premiere Vision, Paris – one of the largest international textile trade shows. For 3 days work was viewed by a wide range of industry contacts some returning to our stand from last year to buy again. Students sold work to a variety of clients from established UK high-street retailers to prestigious Italian mills. Students that worked on the stand gained valuable insight into the textiles industry and first hand experience dealing with clients and buyers. Congratulations to all students that had work selected to showcase and those that sold to industry. Second year Printed Textiles students worked on a live project with the established Hampshire based interiors company Blendworth. After visiting the companies HQ to get a thorough introduction to the company and how they work, students were asked to visit local museums and archives to develop work for the theme ‘Historic Hampshire’ . 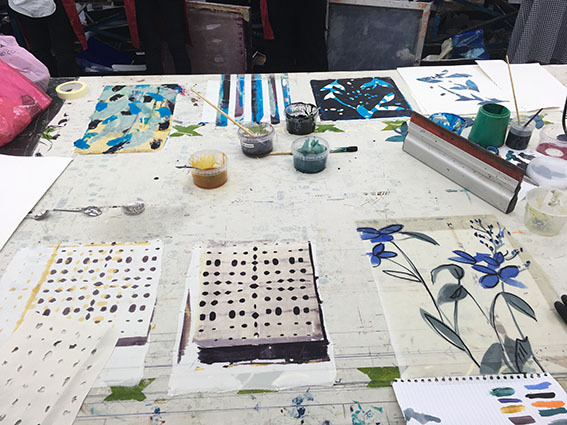 Students were guided by Creative Director, Emma Mawston and Managing Director Andy Hancock to produce repeat designs for furnishing fabrics. During the final Critical Reviews and interviews, two students work stood out to Blendworth – Olivia Shepherd and Ellie Bennewith. Their designs have been bought by the company to be put into production, as well as being given internships to gain greater insight into the company and how their designs will be developed. Congratulations to Olivia and Ellie and we look forward to seeing the final designs when Blendworth launch the collection. This semester London and Shanghai based design studio F-W-S came in to work with the second year Printed Textiles students. 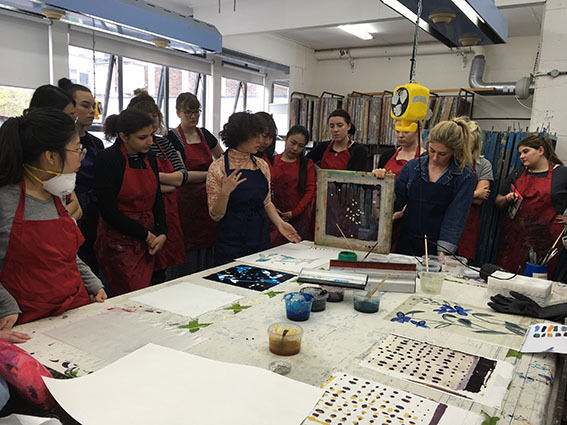 The brief required the students to develop design ideas quickly and creatively using the print workshop as a place to generate ideas rather than just as a place to produced finished designs. Tali Furman, creative director, and Alex Poyner, designer and WSA alumni, came in to give an all-day workshop at the beginning of the brief. The students then had to independently develop a large selection of design ideas and resolved outcomes for critical review, working in the ethos of the studio. At critical review Tali Furman joined academic staff and to give feedback and select students for potential summer internships. At the end of the project Tali invited 4 students for interview – Cassie MacDonald, Aleks Lund, Vivian Ge and Paulina Nieduzak. 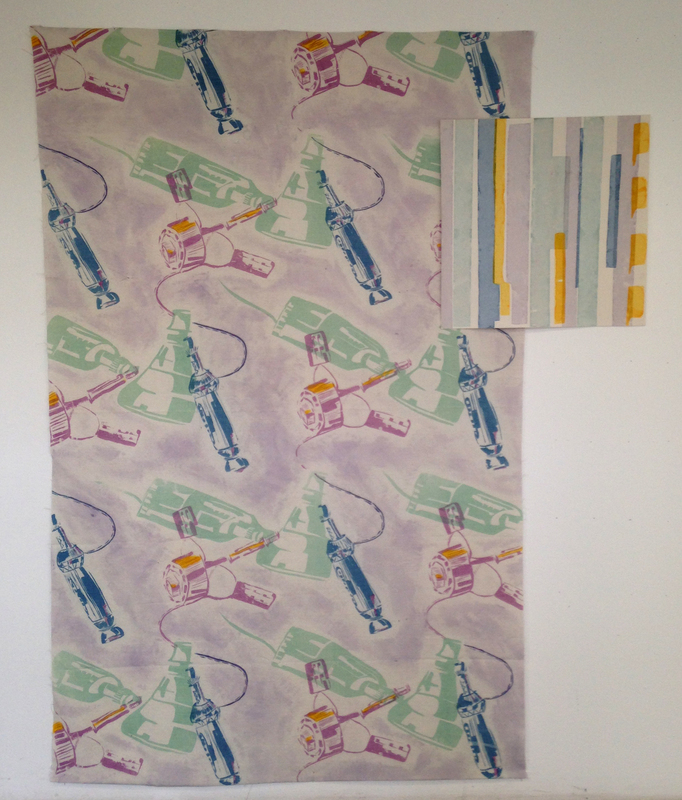 Tongtong Wang has recently completed the Printed Textiles pathway at WSA after joining us in Year 2 from Dalian, China. 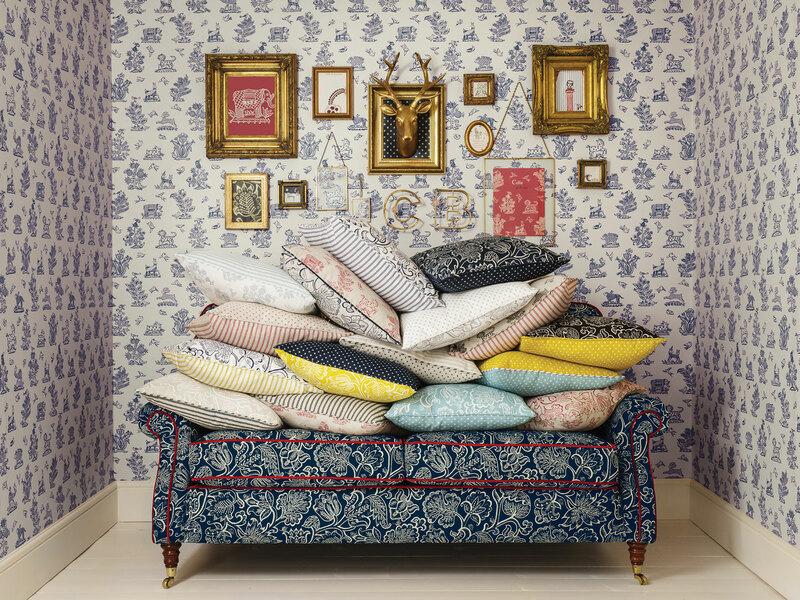 Her final collection has been much admired for it’s fun prints for Interiors. At the Degree Show she was awarded the Nancy Balfour Award for excellence. Her collection focussed on “how to enjoy life and make ourselves better”, emphasising on sports and leisure activities and healthy eating. 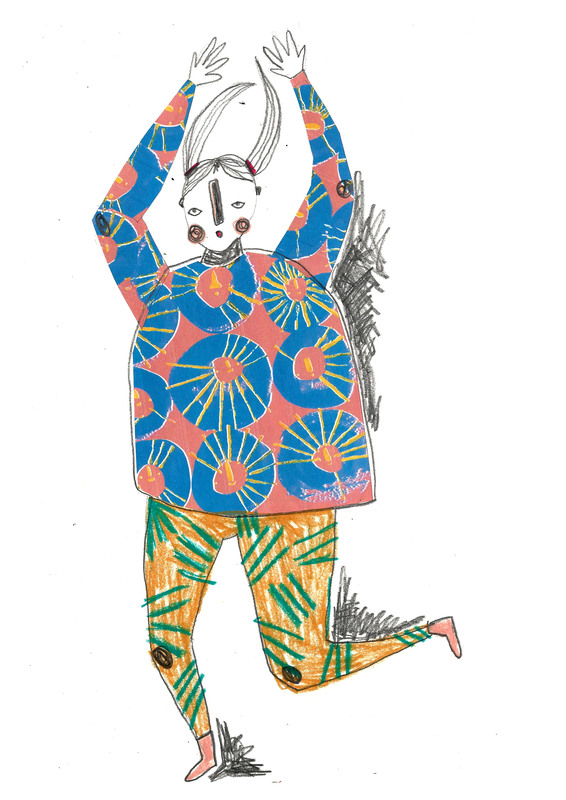 Her collection was intended to be amusing utilising her illustrative style combined with her fun abstract patterns. She was greatly influenced by the work of two photographers Muriel Bordier and Dean Bradshaw. 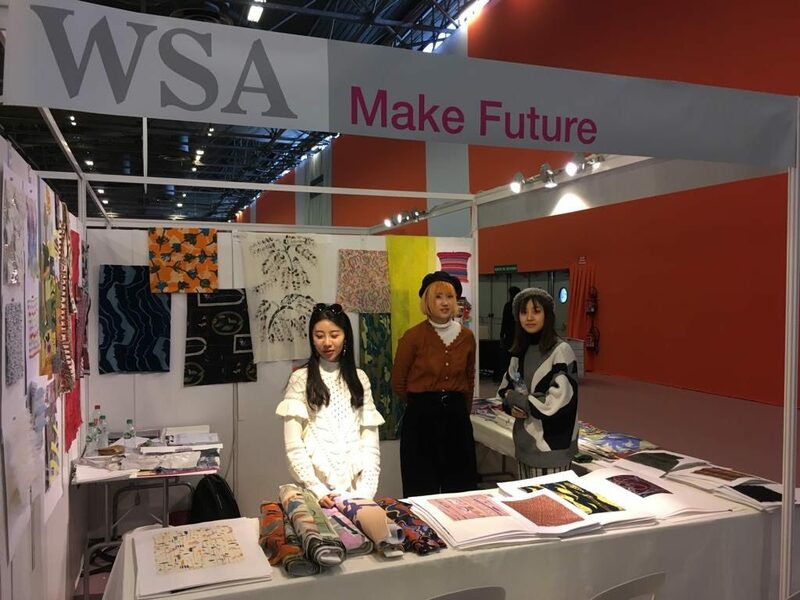 Tongtong hopes for a future career designing for interiors, utilising all she has learnt at WSA. 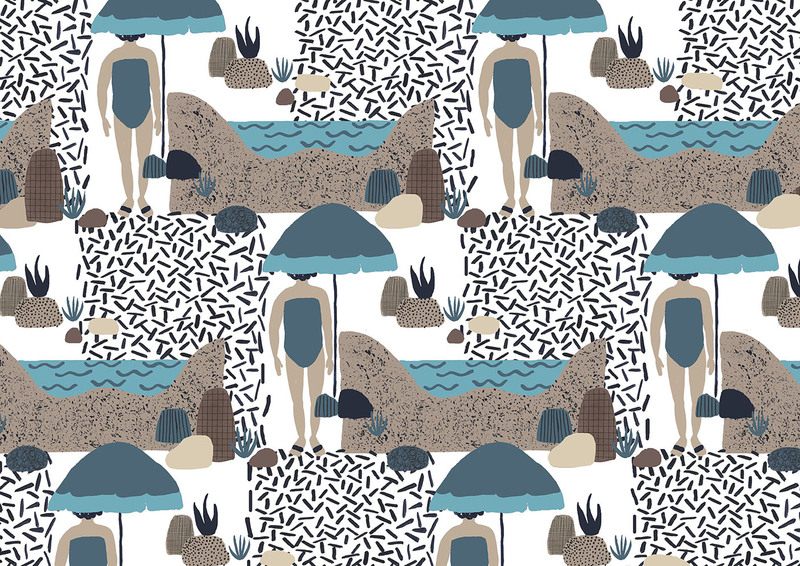 Her work will be at New Designers next week alongside 15 other selected graduates from Textile Design. Last week Sarah Macgregor, Design Director from Colefax and Fowler visited the exhibtion of wallpaper designed by Printed Textiles students and created in their second year. 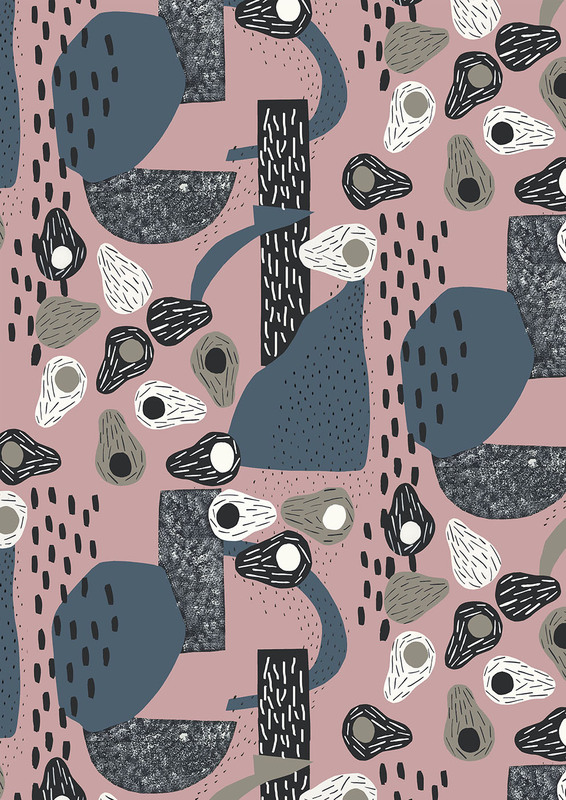 Melissa Ougham’s space inspired wallpaper caught Sarah Macgregor’s eye for it’s bold style and movement. Melissa won £200 and a selection of books. Congratulations! Megan Ferris, currently in her second year of studying Printed Textile Design has won a scarf competion with company Filthy Weather. Her ‘Welcome to Wonderland’ design will be produced as a limited edition silk scarf as well as receiving £400 as part of her prize. 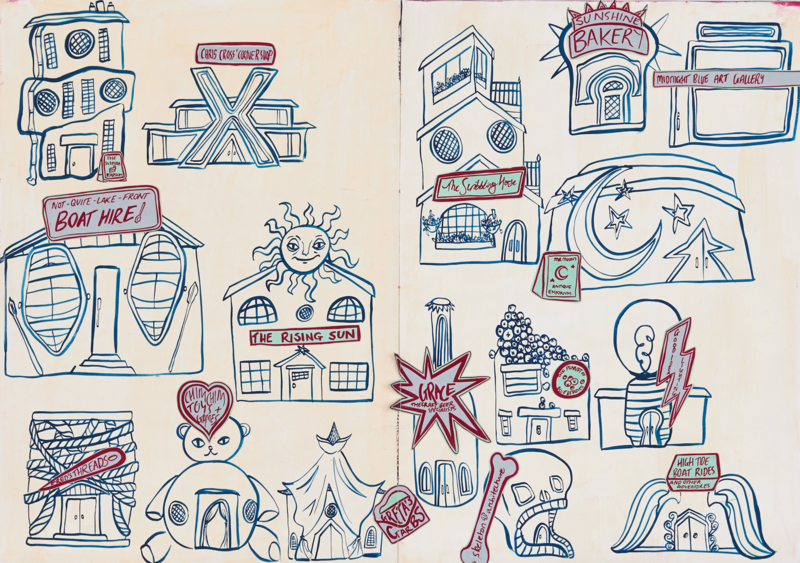 Megan’s scarf design was inspired by the work of Hannah Hoch, the Tim Burton film and other artists such as Polly Morgan, Tim Walker and Ralph Steadman. 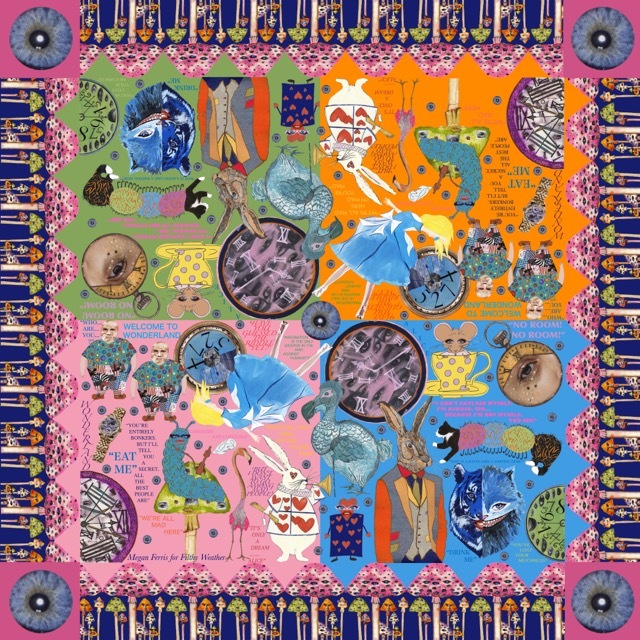 The scarf focuses on the key characters from Alice in Wonderland, surrounded by famous quotes from the book and strange clocks. Colours were inspired by Salvador Dali’s illustrations using the contrast of bright and washed out shades. 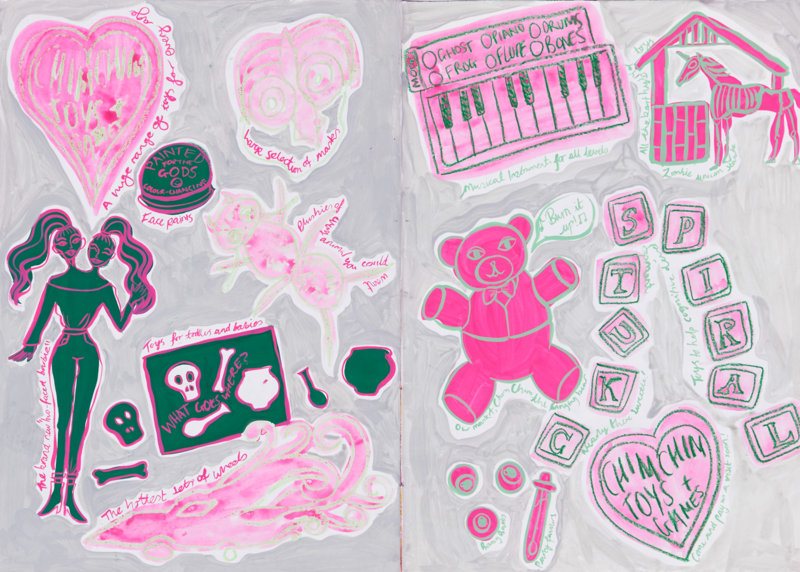 Elements of Megan’s own dreams also inspired some of the images in her design. The scarf celebrates the 150th anniversary of Lewis Carroll’s Alice in Wonderland which takes place this year. 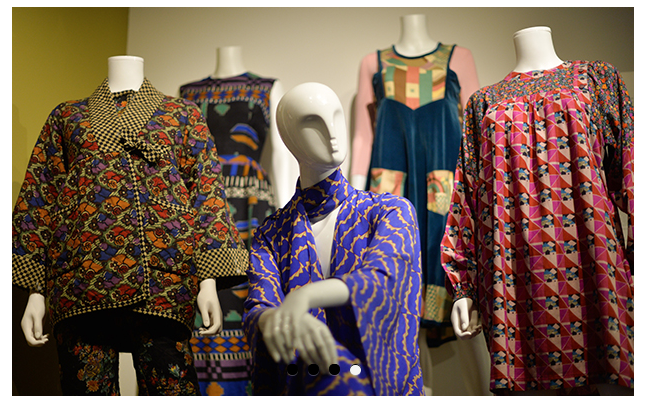 Hear the history of the world-famous London style and design institution Liberty and Co. during the 1950s and 1960s from Liberty archivist and expert Anna Buruma. Accompanied by rare illustrations from the Liberty archive, Anna Buruma will document how Liberty learned from its mistakes and, indeed, successes to remain one of London’s most revered retailers for over 140 years. The event starts at 6pm with a glass of wine in the Museum foyer; the talk follows at 6.15pm for 6.30pm in the Fashion Studio and lasts for approximately one hour including the chance to ask questions at the end. It is followed by a book signing. Ticket includes admission to LIBERTY IN FASHION exhibition and guests are welcome to view the exhibition before or after the event. Anna Buruma is the author of ‘Liberty and Co. in the Fifties and Sixties’. She works as a freelance researcher and has been the archivist at Liberty since 1995 and curator at Central Saint Martins College of Art & Design since 2005. Price £15 / £12 students includes a complimentary drink and exhibition entry. 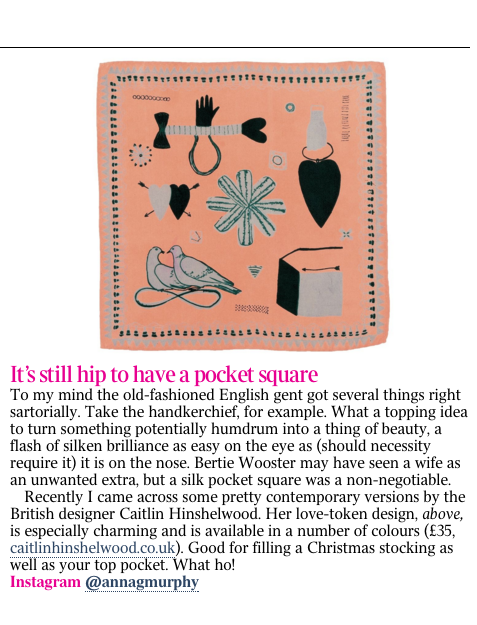 Caitlin Hinshelwood, Senior Teaching Fellow in Printed Textiles, silk scarves were featured in The Times style section last week. All her textiles are hand dyed and screen printed at her workshop in London.